Ana Nogales has been LALIVE’s head of Marketing, Business Development and Communications since 2013. 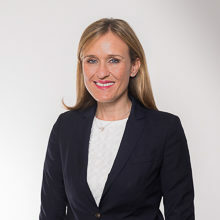 Before joining the firm, she held similar positions at leading law firms in Spain and as part of a consultancy business, advising on law firm business development, communications and management issues. She also worked in-house for a Swiss private bank and as a consultant in a specialist communications agency in London. She holds an LLB (Hons) degree in Law from Durham University. She speaks English, Spanish, French and German.